Royal Canin Diabetic Special is a complete dietetic feed for dogs formulated to regulate glucose supply (Diabetes Mellitus). This feed contains a low level of rapid glucose-releasing carbohydrates. Glucomodulation - specific formula to help in the management of post-prandial blood glucose in diabetic dogs. High protein content - maintenance of muscle mass is essential in overweight diabetic dogs. Low starch formula that contains a reduced level of starch. COMPOSITION: meat and animal derivatives, derivatives of vegetable origin, cereals (maize), minerals, oils and fats. ADDITIVES (per kg): Nutritional additives: Vitamin D3: 120 IU, E1 (Iron): 5 mg, E2 (Iodine): 0.017 mg, E4 (Copper): 0.1 mg, E5 (Manganese): 1.7 mg, E6 (Zinc): 16 mg.
ANALYTICAL CONSTITUENTS: Protein: 9% - Fat content: 4% - Crude ash: 1.4% - Crude fibres: 2.5% - Moisture: 80% - Omega 6 essential fatty acids: 0.7% and Omega 3 essential fatty acids: 0.025% - Total sugars: 0.7% - Starch: 1.6% - Carbohydrates: 3.1%. 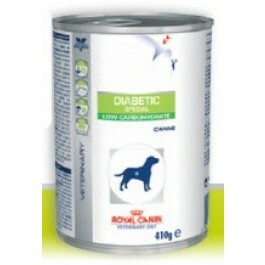 Diabetic Special should be recommended by your veterinary surgeon. For detailed information on feeding amounts and how this food can help your pet, please consult your veterinary surgeon.